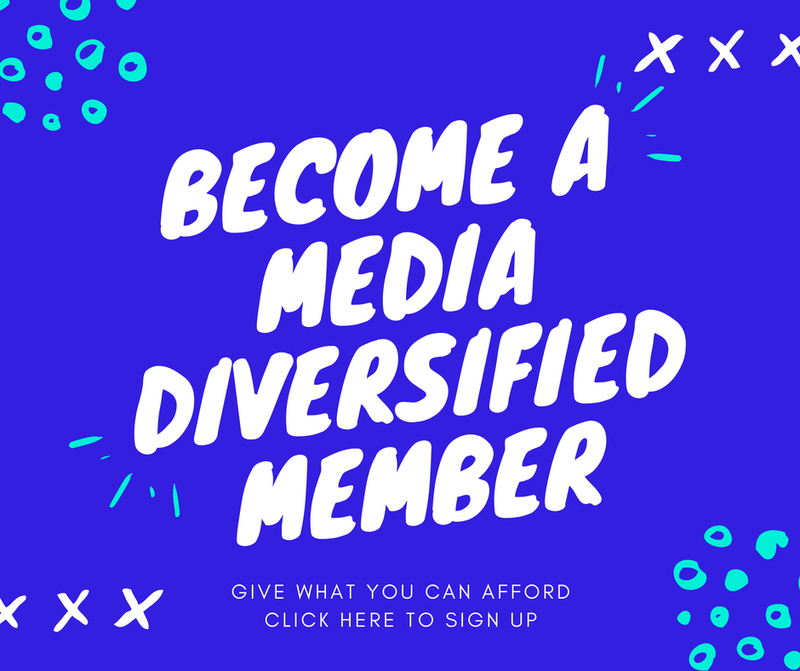 Media Diversified is here to help change the media conversation in the media and foreground the voices of writers of colour. Now, as we move into our next phase with a kickstarter to help support our work, Samantha Asumadu recalls how Media Diversfied got started, and how there is more work to do to diversify our media. In July 2013 I founded Media Diversified. Today we launched a campaign in order to secure our future. It has rewards from fabulous authors such as Asim Qureshi, Yasmin Gunaratnam, Yomi Adegoke, Gary Younge and more. Yet 5 years later, ethnic minorities are still under-represented by 300% in the media industry. 95% of journalists are white, and mainly based in cities such as London which is 40% people of colour. It’s clear that whilst we may be publishing writers of colour the mainstream media are not employing them in any significant numbers. Whilst on sabbatical this year I wrote about a key Media Diversified origin story which dates back to 2014 titled Legacy, Death and Publishing for Black Ballad, a site for and run by black women. I wanted to memorialise these moments before that knowledge is forgotten. Before I founded an organisation for writers of colour I lived and worked in Uganda. I moved there in December 2007. I went to join my then boyfriend who was an aspiring journalist. I was an aspiring documentary filmmaker who had recently finished a contract for Sky’s showbiz website. I came back to London in 2011 to find funding to finish my second documentary film Born Again in the United States of Uganda about the anti gay bill, prosperity gospel, money laundering and ’The Family’ a secretive neo-conservative’ boys club who believed in free trade, abolition of abortion and were virulently ‘anti-gay’. The boys club consists of both Democrat and Republican politicians and others with a lot of money. They fund the national prayer breakfast in America and the national prayer breakfast in Uganda. It’s rumoured that Uganda’s president of over 3 decades is a member. The member of parliament who wrote Uganda’s infamous anti-gay bill, Bahati is a member. In 2010 the Texas Republican party brought out a manifesto. It had striking similarities to the anti-gay bill that came out almost simultaneously. I had been following a pastor for a few weeks who called himself Bishop Kiganda to learn more about Pentecostalism. I had interviewed a few people before about it because my sister became religious after her daughter died and hoped to become a pastor herself (she now is). I was concerned as having gone to Catholic schools throughout my childhood and teenage years, I had an aversion to organised religion, but I wanted to understand so I could support my sister. However I found myself in the middle of a maelstrom just a few weeks later because Bishop Kiganda alongside Pastor Ssempa were at the forefront of the anti gay movement. They are both in my trailer .. However this isn’t a story about my films. It is if you stay with me until the end a story about money. Before I started filming my second film I directed and co-produced my first film. A film for Aljazeera English about three Ugandan women who were rally drivers. I first started work on it in 2008. It took me a year to find a broadcaster with the funds willing to commission me as a first time director to make it. I needed a minimum of $30,000. I got that from Aljazeera. BBC World, UKTV and others while inviting me in for meetings, passed on it. In May 2009 I finished it and AJE broadcast it that year and a couple of times a year until around 2012/2013. I made £1,500 for directing and co-producing the film. My camera men made more. However it did buy me my first Macbook pro, making it easier to find other work. From then I came to the attention of CNN and as and when they needed me I did breaking news reporting for them and for a foreign correspondent agency who got me work with France 24 and others. The reporting I did for them and Deutsche Welle for whom I went to Congo to make a film on Blood minerals is the basis of my in progress book #TheWannabe, excerpts of which are linked in this twitter thread. The photo to the left was taken on the day I reported from a landslide in eastern Uganda that killed over 300 people. I thought I was going to die that day. I got separated from the other journalists including my then boyfriend who I travelled with and with whom I walked four hours up a mountain at 6am that morning in order to get to the site of the landslide in Budada. My separation from them took me around two and half hours up another mountain in the rain away from Bududa. I filmed some videos (disturbing images) before I got separated from the other breaking news reporters. The reason this is a story about money is because since that trip nothing else has ever mattered as much as not dying that day. Including making money. That’s why I was willing and able to work at Media Diversified for years without earning a wage. For me it was always about the liberation of black and brown people, especially women and uplifting them where I could. It wasn’t until I worked in construction this year that I realised the value of earning and having money. Having learned the value of money earned (the hard way as a labourer) I have learned the value of me. Whilst I got terrible A levels and subsequently went to an ex polytechnic (which I loved) by virtue of my life experiences, founding Media Diversified, being a journalist and filmmaker, and even when I used to run club nights in Central London and organising @NowruzNoWar with others and latterly as a comment writer I know I have value. It’s why I can burn bridges with the New York Times and withdraw a commissioned article from the mainstream media with no qualms. It’s why I can turn down an Edmalia Ltd client who wanted to underpay us. I am lucky that I haven’t had a boss (bar in construction) for years. That privilege has meant I can pretty much say what I like and no one can fire me. However I know that I have forced myself in to that privileged position. Most writers don’t have the luxury of dragging the Guardian or the New Statesman on twitter every other day. They may want to get published by them at some point, and why shouldn’t they? It’s why writers of colour NEED institutional backing and editors who will support them when they inevitably run foul of the right wing or nominally liberal media. That’s what Media Diversified has been doing for 5 years.. We have positioned ourselves as an alternative institution (that includes The Trashies) because we had to. “Media Diversified was established in 2013 to help change the conversation in the media and foreground the voices of writers of colour. Since then we’ve made a considerable impact for a small non-profit organisation. We were cited in The Guardian for campaigning on the lack of media response to black deaths in police custody, and in the Telegraph on abuse by soldiers in peacekeeping roles. More recently, we were cited by a Times columnist responding to our no-holds-barred piece “Melanie Phillips wants to destroy the Muslim world”. We published From the Lines of Dissent, a compilation of select articles, comment pieces and academic analysis originally commissioned for Media Diversified’s online platform, covering politics, literature, sexuality, education, religion, media and much more. That’s the kind of impact we’ve been trying to create at Media Diversified. And over these last five years, we’ve been challenging and shaping the regular news agenda in our own way, diversifying the media landscape and platforming voices you wouldn’t necessarily hear in mainstream outlets. There is definitely more to do in order to reverse decades of under-representation of ethnic minority voices in the UK media. The statistics are sobering: ethnic minorities are under-represented by 300% in the media industry. 95% of journalists are white, and mainly based in cities such as London which is 40% people of colour. One of our young writers could be a future national newspaper editor or BBC Director General and we want to support them in their aims. And it is that last line that should jump out at you. We have been punching above our weight for the past five years, but we want to be around for the next five years at least. We want do news, investigations, more events and continue with our signature comment pieces. But we need your help to do that. Please share our campaign amongst your networks. Please donate if you can whether that is by a reward (contact us at info@mediadiversified.org to arrange that) or cash. Really any amount will help. Thank you for reading this post and supporting us to support writers of colour for the past 5 years. We appreciate you!